Thrivous Clarity Reviews - Is It Worth Your Money? Thrivous Clarity Reviews – Is It Worth Your Money? 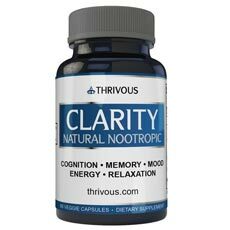 Thrivous Clarity belongs to a class of nootropics, which helps to improve focus, memory and mood. This product is made up of natural ingredients that blend together to form a powerful nootropic. This formula also helps the user to relax and reduce anxiety. Although this product is a stimulant, it is not a strong one, but it compliments stimulants like caffeine when the user needs them. This is a product of Thrivous Company based in Orem. The company was founded by Dorothee and Lincoln in 2016.. Their first product was produced towards the end of 2016. The product is manufactured under strict adherence to FDA and GMP regulations. The end product is also tested to ensure quality and potency. The ingredients used are also tested for metals and harmful substances before manufacturing. This guarantees the safety of the user. Who Can Use Thrivous Clarity? This product is recommended for adults who want to improve their focus and productivity at work. It can also be used by students who spend a lot of time reading to boost their concentration levels. However, pregnant or lactating women, as well as children, are not allowed to take this product. The user should also consult the doctor before using any supplement. What Does Thrivous Clarity Contains? This product is made up of well-selected ingredients that are blended together to come up with a high-quality product. Thrivous Clarity gives the desired results within 2 weeks of continued use. The good thing is that the manufacturer has provided the amounts of ingredients used. Thus the user is fully aware of what they are getting from the nootropic. Bacopa Monnieri (600mg) – This creeping herb is found in wetlands. It is used to improve memory. Rhodiola Rosea (300mg) – Is a perennial flowering plant grows on sea cliffs and mountains. It is used to improve focus and mood. Zinc (11mg) – This is found in various grains. It is used to improve mood. ADO/MECBL (Adenosylcobalamin and Methylcobalamin) – This is also bioavailable. B Complex (51mg) – These are essential nutrients that convert food into energy. They help to support healthy brain function. What are the Pros of Thrivous Clarity? It may help to improve focus. The amounts of ingredients are fairly outlined. It does not contain animal products. It may help to improve memory. What are the Cons of Thrivous Clarity? Its result may not be immediate. There are no side effects reported after using this product. It is, however, advisable that you consult your doctor before taking any nootropic or any supplement whatsoever. Brain function may reduce due to various factors that may include stress, overworking and sometimes age. To maintain focus, memory, mood and improve productivity the brain needs nourishment from vitamins and nutrients. That is why we have Thrivous Clarity which helps to deal with the aforementioned issues. The product is made up of all natural ingredients that are subjected to vigorous testing to ensure that the safety of the user is guaranteed. The product is also free from gluten and animal products. This means that is vegan-friendly. There is however some precaution for the use of this product. Expectant or lactating mothers are not supposed to take this product. The user is supposed to take two capsules with a meal preferably in the morning. This dosage can be adjusted according to the needs of the user. However, this product has not yet become popular among the people. Probably the reason why there are no customer reviews about the product. There are numerous nootropics in the market that compete with this one. You should ensure that you do vetting before settling on any of them.